Tourists from all over the world travel to Hendersonville on bus tours which takes then to homes of a variety of Country Music stars. 3 to 5 buses stop at Golden Era Plantation daily throughout the year. However, during the CMA Music Festival it increases to approx. 10 buses. Fans step off the bus at the gates and take pictures of the historical home and the carved tree but the tipis have been missing. 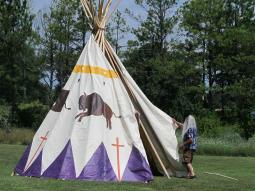 Golden's last tipi was destroyed in a tornado which damaged the house six years ago. Golden was pleased when the painted tipi arrived just in time for the festivities. The tipi is painted to represent his life and property. Eagle feathers hang from a golden ring at the top to represent the accommodation he received from the National Cherokee Indian Association for his life's work, the bison around the middle represents the mascot of Station Camp High School which is located across the creek from his property. The purple triangles represent peace and the orange crosses represent his faith.